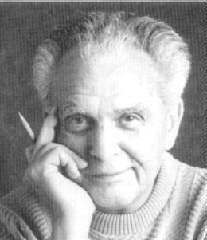 Jack Kirby had helped DC to revitalize the superhero in 1957 with the Challengers of the Unknown. He helped to write and draw 4 issues of Showcase, and then 8 issues of their own title before leaving DC in 1959 and returning to Atlas Comics, which was about to change it's name to Marvel Comics. Marvel had not yet gotten back into publishing superheroes however and Jack drew sci-fi, mystery and western comics for the next year and a half. 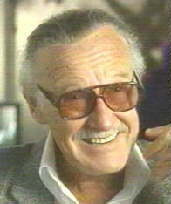 Then one day in 1961 Jack arrived at the Marvel offices finding editor Stan Lee sobbing and movers taking the furniture out of Marvel's offices. Marvel, the company that Stan's uncle Martin Goodman founded in 1939 with Marvel Comics #1 was about to go out of business. Stan may have been sobbing, but Jack on the other hand wasn't about to lay down. He had been making a living from the comics industry since the thirties and had seen the best of it and then in the fifties, the worst of it, and he had nowhere else to go! Jack convinced Stan to let him try something new for Marvel. Jack after all was right there when DC brought back super heroes and he was going to do the same for Marvel, but one better! 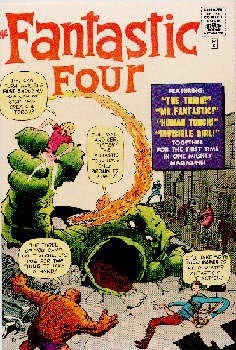 In September 1961, the Fantastic Four debuted in their own title (cover dated November), and they were not just a hit, they were an absolute smash!! 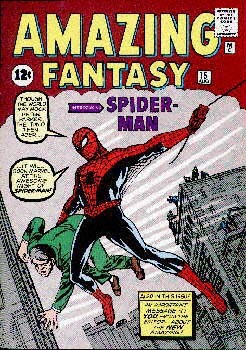 Marvel followed this with the introduction of a most unlikely superhero with the Incredible Hulk #1 (cover dated May 1962), followed by most likely the second most famous comic book superhero of all time with Spider-Man in Amazing Fantasy #15 (cover dated August 1962). A nerdish teenager with real teenage troubles had been bitten by a radioactive spider, transforming him into a freak able to climb walls by sticking his fingers to it and with the strength of fifty men. In the next two years Jack Kirby and Stan Lee would introduce scores of heroes from the Giant Man and the Mighty Thor to taking a note from DC and reintroducing the Sub-Mariner and the legendary Captain America. But what really propelled Marvel was an entirely new ingredient. When Superman donned his cape, he never intimated that he didn't want to be a superhero. As a matter of fact he was intended to be a superhero was your impression of him. Batman only didn't want to be a superhero because he only became a hero after his parents were murdered. These heroes weren't beset by the troubles real people had in general. I always looked at superheroes as being entertainers. But the Marvel heroes were different. they were beset by all nature of human malady. The thing didn't want to be an ugly monster, Bruce Banner didn't want to change into the Hulk and poor Peter Parker was always looking out for his Aunt May's health. Spider-Man may be the most obvious example of the soap operatic comic continuity. He was at first in high school, then college over the years and grew from a bespectacled teenager to a mature man (shades of Gasoline Alley), which is in itself unlike any superhero before him. This new style of comic story resulted in a revolution in comics. Today's comic heroes are so bogged down by the human condition that to many, the entertaining factor that made fans read comics thirty years ago is mostly gone, having given way to the X-Generation's (in Marvel's case particularly) popular comic interests.